Here at Kids Love Rocks we strive to offer educational resources for teachers and students alike. Please take a look at our free resources as well as possible products that can be used for your classroom! 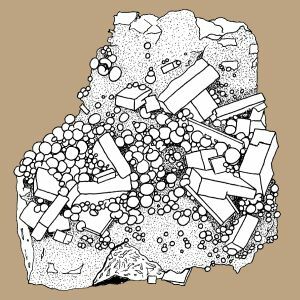 We now have a whole group of coloring pages related to mineralogy! Click on the links below and see which one you would like to color, then print out the page and have fun working on your project! Look at all of the rock and mineral crossword puzzles we have added! Click on a puzzle, print it out and start looking for the answers! Are you good at finding hidden things? A word search is just like rock or mineral collecting. When you are out on a rock hunt, you must look at thousands of rocks all around you as you seek out a special find. With a word search, you are looking at lots of letters trying to find the words that are hidden amongst all of the letters on the page. Are you ready to test your skills of observation? Go ahead, click on a word search puzzle, print it out and start looking for all of the words! We have just added the Golden Bear Nugget Trading card along with 8 other fascinating minerals into our latest set of free mineral trading cards! This new set includes Agate, Garnet, and Tourmaline to name a few. Be sure to download the all of our other mineral trading cards. We now have a total of 5 sets of Mineral Trading Cards for you to download and print out. Carefully cut out each of the individual cards from the set. Once you have all of your cards you can look at the minerals, learn their names, and find out interesting facts about them. These cards can be used as part of a flash card game where you guess the mineral on the card. You can also use the cards as a reference when you are looking for minerals to collect. We hope you have lots of fun with our mineral trading cards. When minerals form a flat surface it is called a face. Minerals can have many flat surfaces and when these faces join together, they form a crystal. Download the activity page on the left and create your own mineral face or even a mineral cartoon character out of the mineral faces on the sheet. Would you like to learn more about crystals? We have put together a special activity where you can make crystals at home. Click on the activity on the left and find out how to grow your own crystals or click here to go there. Streak is the color of a mineral when it is crushed into a powder. Mineralogists do a streak tests on a minerals to help identify them. If you would like to learn more about streak, we have created an activity sheet about streak. Click on the activity page on the left or click here and see if you can find the streak for all of the minerals listed.